Sketches of Canada for December 24th! You have all heard about the Christmas Goose! Well here is a Christmas Truce! 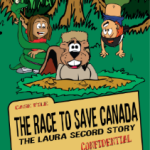 This Canadian History for Kids, Sketches of our Canada, looks at an amazing tale of Peace on Earth during a horrible time in world history. 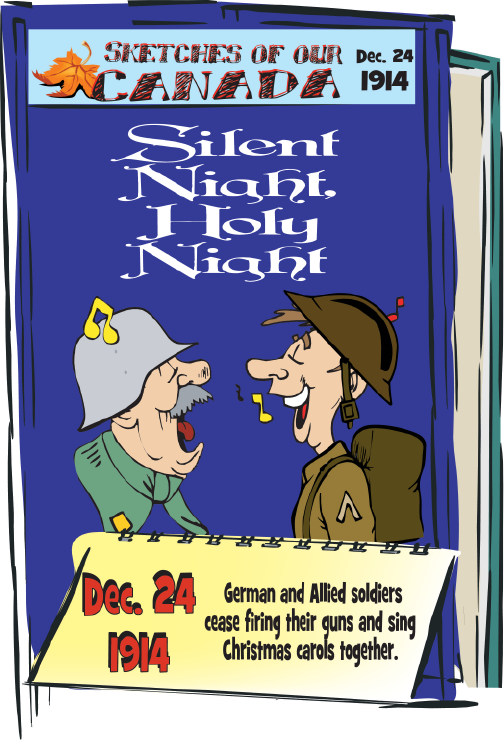 On December 24th, 1914 the two sides of World War 1, took time to celebrate Christmas. In the winter of 1914, the British, Canadian and French were able to hold off the Germans in Ypres, Belgium. Each side dug trenches which were only a few hundred feet apart and separated by flat ground known as “No Man’s Land”. On the evening of December 24, 1914, everything went quiet on the Western Front as the rain kept pouring not only flooding but turning the trenches into muddy holes. Suddenly carolling could be heard from the German trenches where Christmas trees with candles could be seen. Soon both sides were singing carols, taking turns singing the carols in their native languages. Then each side started calling out to each other inviting them to celebrate the holiday season. That night they drank and talked. The next morning, Christmas Day, was celebrated together in “No Man’s Land” with each side visiting, singing, exchanging gifts of food, warm clothes and tobacco, and even playing a game of soccer. While never recorded some say the soccer came was won by the Germans with a score of 30-2. It is believed that the celebration continued until Boxing Day and in some areas until New Year’s. Not all the time was spent celebrating, once the truce was agreed upon, both sides went about the sad job of burying their fallen comrades, often in joint burial ceremonies. The mingling was not welcomed by the commanding officers on both sides. Soon both sides reluctantly returned to war and as the units rotated out, the friendships made that Christmas were forgotten.